I was able to create the SharePoint Data Connection Library. Then I move to the To create a new data connection file in InfoPath section. I get to step 7 and encounter the error before I can finish. I have my dataconnectionlibrary Data Connection that I just created highlighted. I click Convert to Connection File button. Then as instructed, I put the address of the SharePoint Data Connection Library in followed by a chosen filename then the .udcx extension. This happens no matter which Connection link type I choose (Relative to the site collection OR Centrally managed connection library). This happens no matter where I specify to put the file; I can Browse to my own Documents folder and it still gives me this error. Looking for any kind of help on this one. Trying to create the Data Connection Library due to 5566 error trying to auto populate user info with GetUserProfileByName using SOAP in InfoPath form. Is there a workaround, a different way to create the .udcx file? This is so frustrating, running into error after error just trying to auto-populate a Person Picker control. This may work for some people who may have InfoPath installed on the server which I think is a bad practice. I had the exact same problem and I logged onto the SharePoint server, then in the site I opened the form for edit in InfoPath, and then I followed the same steps to create a Connection File. If you're doing this on Windows Server 2012, there's actually a much easier solution. You need to install the feature Desktop Experience (for reasons I don't quite understand, admittedly). 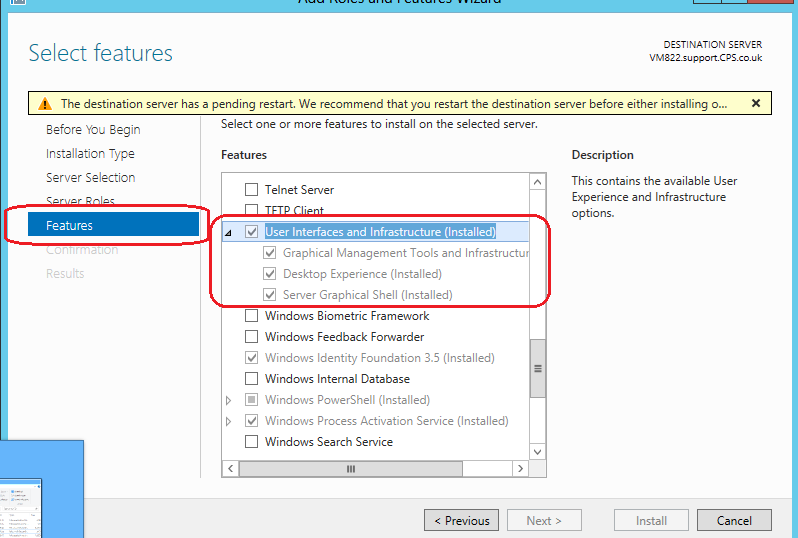 You can get to it in Server Manager under Features > User Interfaces and Infrastructure. Your machine will require a reboot, but after doing this, you'll be able to create the UDC file without any issue. 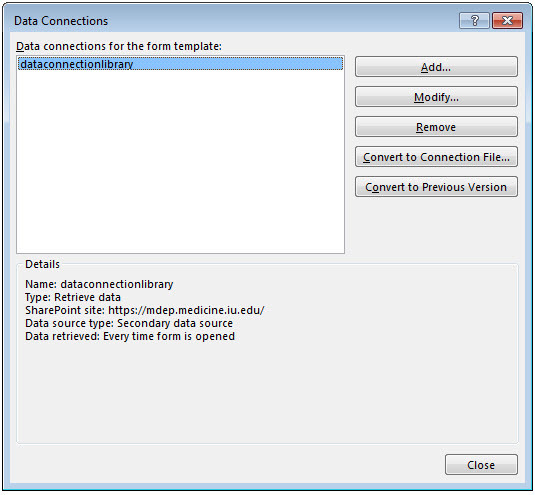 Use infopath 2010 instead of infopath 2013 when converting the data connection, then revert to using infopath 2013. This guaranteed to work. There are two ways which this question could be answered: 1. Fix the problem causing the error so that the .udcx file can be created in the traditional way on our SharePoint 2013 environment, OR 2. Workaround the error and create the needed .udcx file some other way. My answer will be the latter approach, a workaround. Some thoughts on the former approach. Unfortunately, the SharePoint “team” at my job consists of the Web Applications Manager and me—and I’m actually just a desktop support helpdesk technician that assists the Web Apps Manager one day a week. In short, we cannot figure out why we’re getting the “The specified location does not exist or could not be opened. 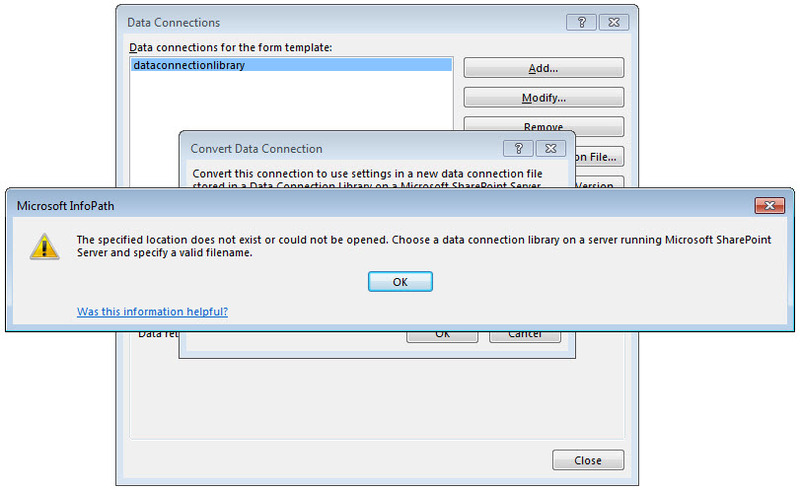 Choose a data connection library on a server running Microsoft SharePoint Server and specify a valid filename,” error. We don’t have enough time to dedicate to the problem. We’ve already spent several hours on it, and we have a hunch that it’s due to a problem with the Desktop Experience in our environment. Desktop Experience is installed. It’s turned on. Necessary services are installed. All the settings are correct, yet it still doesn’t work. Digging in some forums and making some connections, my Web Apps Manager thinks that this problem is the root of my problem with creating the .udcx file—during creation SharePoint or InfoPath need to “see” in Explorer. We can’t open anything from SharePoint or InfoPath (so far as any form is connected to our SharePoint) in Explorer. So I had to come up with some other solution. It’s fortunate for me that we’re still migrating from a SharePoint 2010 intranet to a SharePoint 2013 intranet. The 2010 environment is still live. So basically I created the .udcx file I needed following the traditional method in our 2010 environment, opened that file in Komodo Edit, changed the xml code to match our 2013 environment, uploaded the edited .udcx file to the Data Connection Library in the 2013 environment, then created a data connection directly to this new file in InfoPath (for a form to an item list in the 2013 environment needing GetUserProfileByName). Let me go through that step-by-step and show you what the xml code looks like in case you’re in a similar situation with no way to create the actual .udcx file other than manually. a. 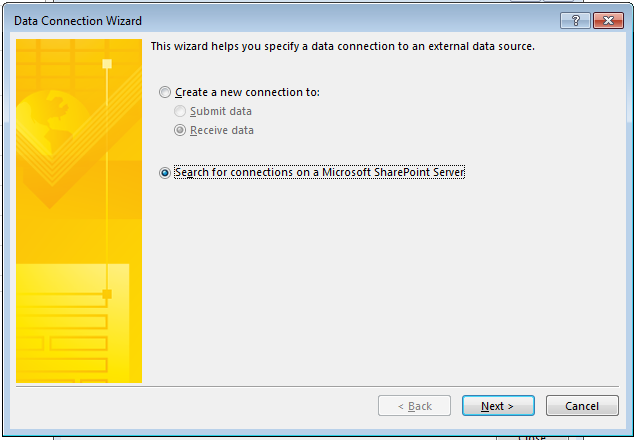 Follow "To create a SharePoint Data Connection Library" section instructions steps 1-4 on both my SP 2010 environment and my SP 2013 environment. b. 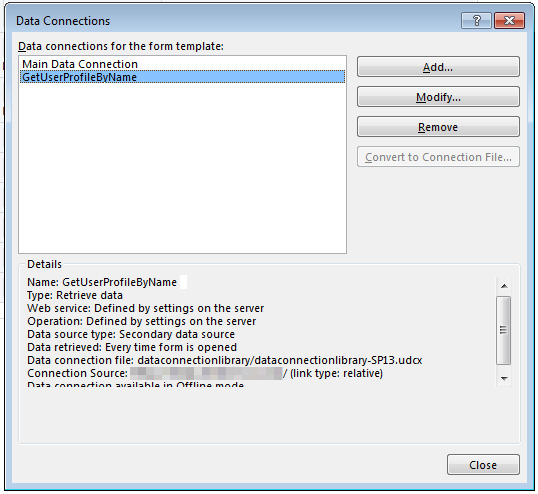 Follow "To create a new data connection file in InfoPath" section instructions steps 2-5. Note that you can do this with a blank form from either environment or just use the actual form you need the data connection file for in the first place. The form isn’t really the important thing in this section—it’s that we get the data connection created with the correct settings. I’m wanting a SOAP Web service connection to connect to User Profile Service, so that’s what I choose during step 4, and then enter [address of my SP 2013 home] followed by “/_vti_bin/UserProfileService.asmx” when prompted for a location. When prompted to Select an operation, I choose GetUserProfileByName. I leave the next few screens at default setting and click through until Finish. 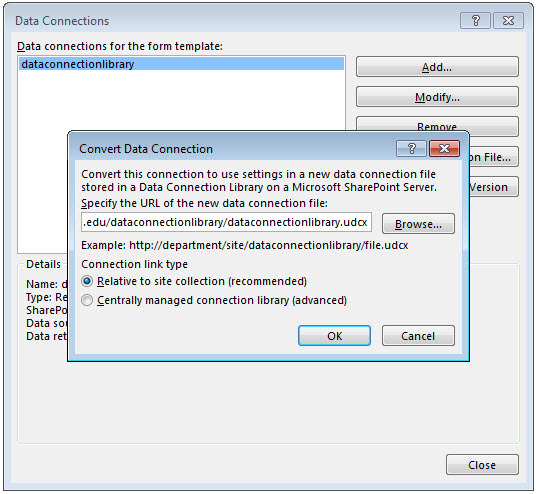 c. Follow "To create a new data connection file in InfoPath" section instructions steps 6-8 using the SP 2010 environment’s Data Connection Library created in previous step a. I had to use this and not the SP 2013 library, because my issue was that I can’t get these steps to work in my SP 2013 environment. Now we have a working data connection file. d. Make necessary edits, save .udcx file locally. Delete what’s there and make the changes if necessary. Save the (edited) file to your desktop and maybe name it something like dataconnectionlibrary-SP13.udcx to differentiate it from the original. 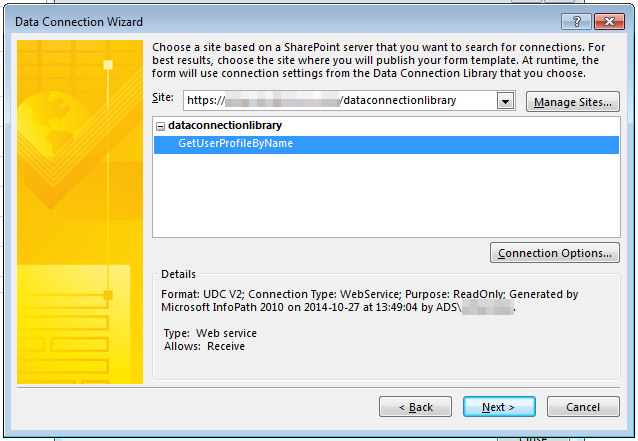 e. Upload dataconnectionlibrary-SP13.udcx to SP 2013 Data Connection Library. f. Open the InfoPath form that needs the data connection file in Designer. In the Data ribbon, choose Data Connections. Click Add. Choose Search for connections on a Microsoft SharePoint Server and click Next. On the next screen, the Site we want is the address of the Data Connection Library on the SP 2013 environment. If it’s not in the dropdown, click Manage Sites and add it. Once it’s selected you’ll see an expandable section and the .udcx file we just uploaded. Note it’ll be named by the Title in the library and not the name; it might not be called dataconnectionlibrary-SP13; SharePoint automatically titled my file GetUserProfileByName, so that’s what I see. At this point, the problem is solved. The result is the creation of a data connection that’s exactly the same as if we’d followed all the instructions on this article and traditionally created a .udcx file. 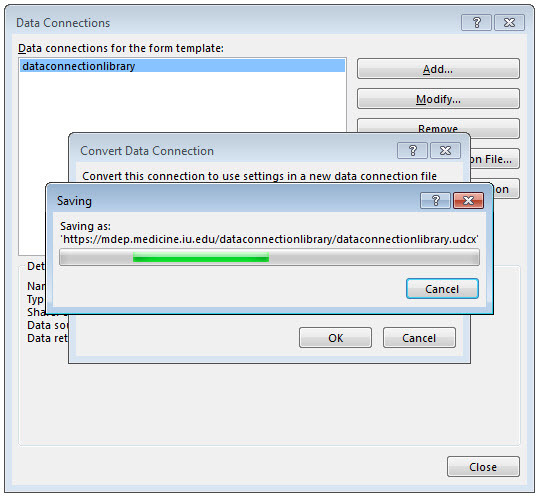 "How To: Create and Use a Data Connection Library." Office Development SharePoint SharePoint 2010 SDK Documentation SharePoint Server 2010 General Reference Application Services InfoPath Forms Services Working with Data Connections How To: Create and Use a Data Connection Library. Microsoft, 2 Apr. 2010. Web. 27 Oct. 2014. MSDN. "Universal Data Connection V2.0 Reference and Schema." Office Development SharePoint SharePoint 2010 SDK Documentation SharePoint Server 2010 General Reference Application Services InfoPath Forms Services Working with Data Connections Universal Data Connection V2.0 Reference and Schema. Microsoft, 7 Aug. 2013. Web. 27 Oct. 2014. MSDN. Not the answer you're looking for? Browse other questions tagged infopath error soap data-connection infopath-data-connections or ask your own question.